Hulu has added the Yu-Gi-Oh! : The Movie and Yu-Gi-Oh! : The Dark Side of Dimensions films for users in the United States on November 15th, 2018. Warner Bros. and 4Kids Entertainment produced Yu-Gi-Oh! : The Movie as an American original film based on the Yu-Gi-Oh! anime. It opened in the United States in 2004 and later aired in Japan as a TV movie in 2005. In Yu-Gi-Oh! : The Movie, a heroic Yugi squares off against archrival Kaiba in an adventure even more dangerous when the imaginary monsters in their playing cards become ferociously real… and when an old evil enters the fray. Who will win this ultimate smackdown? Whether you’re a novice Duelist or a professional, you’ll want to watch and find out! Fathom Events screened the film again in the United States back in March of this year. Warner Bros. released the film on DVD and VHS in 2004. 4K Media Inc. and Screenvision Media screened the Yu-Gi-Oh! : The Dark Side of Dimensions film with an English dub in North America in January 2017, and Eleven Arts screened the film with English subtitles that April. In Yu-Gi-Oh! : The Dark Side of Dimensions, the stakes have never been higher; the rivalries never as fierce; the risks never so great. One wrong move—one card short—and it’s game over for good. A decade in the making, Yu-Gi-Oh! : The Dark Side of Dimensions features new designs and an all-new story from the original creator of the global phenomenon, Kazuki Takahashi. His masterful tale features anime’s most beloved characters in their long-awaited return: Yugi Muto, Seto Kaiba and their faithful friends Joey Wheeler, Tristan Taylor, Téa Gardner and Bakura. It’s the most highly anticipated re-YU-nion ever! The film premiered in Japan in 2016, and STARZ, the premium cable network, added the film this past April. Anchor Bay released the film on Blu-ray Disc and DVD in the United States in June 2017. 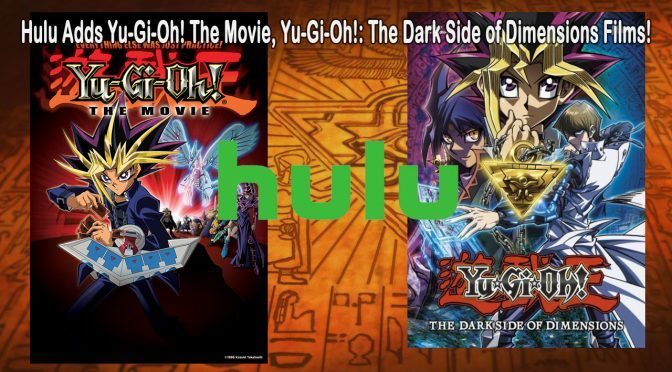 If you have not yet seen these movies, now would be a great time to sit down with Hulu and some friends, and have a d-d-d-dduelingly-wonderful evening with Yugi and all his friends. Let us know below in the comments if you have or will see these films and what you thought about them.